93 mins. Rated R for zombie-related violence. There have been many “boy and his dog” movies, but there has never been one like Fido, an overlooked zombie movie from about 8 years ago. It takes place in an alternate past, where some time around the 1950s, a zombie outbreak occurred, and was quelled. In the aftermath, a company called ZomCom was created, among its many creations were collars used to domesticate the zombie menace and essentially enslave them to do menial tasks and become like pets. Timmy Robinson (K’Sun Ray) and his family just got a new zombie of their own. His mother (Carrie-Anne Moss, The Matrix, Pompeii) is all for it. His father (Dylan Baker, Spider-Man 2, Anchorman 2: The Legend Continues) is not. As a status symbol of their community, the zombie, named Fido (Billy Connolly, Brave, The Hobbit: The Battle of Five Armies) grows an unlikely friendship with Timmy, and trouble ensues. It is difficult to classify a zombie movie as cute, but this one is. The environment is as though we never stepped out of the 50s, but we also get the addition of zombies as domesticated animals. It is a unique environment, and one that we are unlikely to see again. The strong acting performances from Moss, Baker, and Connolly are what carry this movie. We also get a great supporting turn from Tim Blake Nelson (O Brother, Where Art Thou?, Kill the Messenger) as Mr. Theopolis, the next door neighbor whose relationship with his zombie may not be politically correct, even in this world. 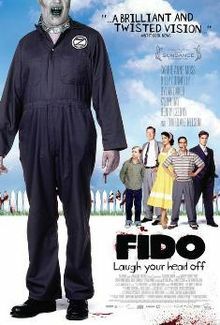 As it comes down to it, Fido is a fabulous movie and one that doesn’t leave you for some time, the goofy premise and strong acting chops make this a satire worth remembering. 2006, 31 Days of Horror, Anchorman 2: The Legend Continues, Andrew Currie, Billy Connolly, Brave, Carrie-Anne Moss, Dennis Heaton, Dylan Baker, Fido, Henry Czerny, K'Sun Ray, Kill the Messenger, O Brother, Pompeii, Robert Chomiak, Spider-Man 2, The Hobbit: The Battle of Five Armies, The Matrix, Tim Blake Nelson, Where Art Thou?